The November 2019 Libra horoscope foretells that family issues will be more important to you this month than career development. Outer security will also not be in focus this month. The Libra zodiac sign this month is in control of people and situations that surround him or her. According to the Libra horoscope 2019 predictions, you have the power and ability to get things done swiftly and efficiently. The forward movement of planets helps you achieve this. The Libra personality is pleased when people have to follow his or her directions and commands. You will be more aggressive than you usually are to get things done. As per the November horoscope 2019, passion and romance will reign in your relationship with your spouse or partner this month. Your love life will advance smoothly. This is the month that you should consider a first or subsequent child. Each of you in the relationship will always be happy and glad to make the other smile and be happy one way or the other. Libra November 2019 predictions show that this month your family will be in peace. All family members will be united and harmonious. The elders in the family will be pleased by the efforts that you are making to make everyone happy hence they will bless you abundantly. According to the 2019 November Libra horoscope predictions, your health will be good this month. You will not encounter any problems unless you decide to be careless with your health. The astrological predictions for 2019 show that you will be busy working on ensuring that the career paths of other people take root. You will put your professional development at a standstill as you cater for the people who need your assistance. November 2019 astrology is foretelling that money will come easily to you this month. The money will come to you via your salary and other business ventures that you are involved in. You will be able to cater to your personal and family expenses without any difficulty. 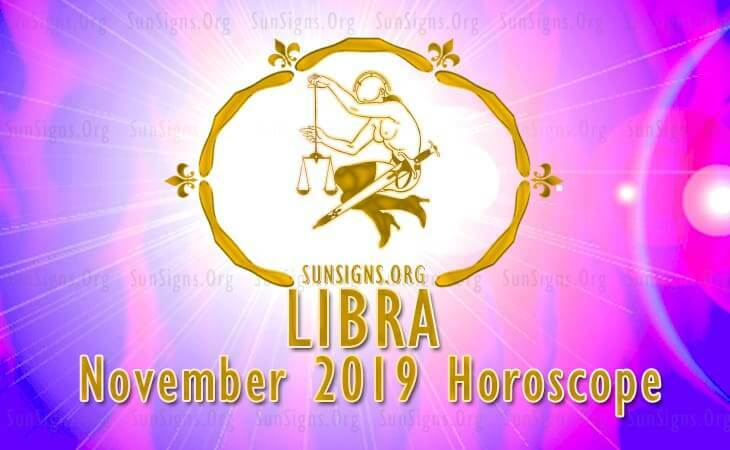 Libra November horoscope 2019 shows that your educational pursuits this month will be blessed with success and loads of achievements. You will receive awards in school whether in higher learning institutions or education related seminars. Based on the November 2019 Libra horoscope, this month is excellent for personal and professional reasons. You will succeed in whatever you plan. See Love Horoscope for 2019.